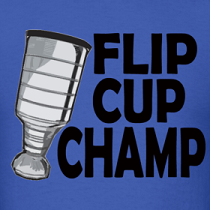 Dirty Dangle Hockey: Who Will Be This Year's John Druce? Who Will Be This Year's John Druce? 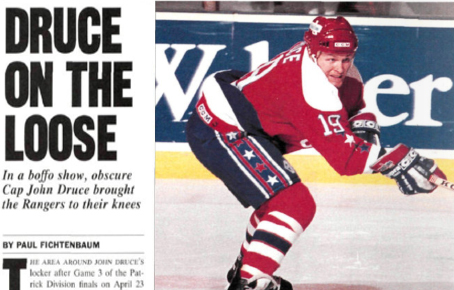 Back in the 1990 playoffs, John Druce of the Washington Capitals played some of the best hockey of his career putting up 14 goals in 15 games and leading his team in points with 17. This was a big deal because Druce was a 4th line defensive player who scored 8 goals during the regular season, but seemed to save his best for when it counted as he helped the Capitals make it to the Conference Finals and become a playoff legend. More recently we saw Joel Ward put up 7 goals and 13 points in 12 games last playoffs with the Nashville Predators and earn himself some John Druce comparisons after scoring only 10 goals in the regular season. That playoff performance helped him earn a four-year-contract from the Washington Captials last July for $3M a season - pretty good cheddar for a checking line guy. Talbot scored 3 goals and 4 points on his way to sticking it to his former team. Last July, Talbot showed there is no loyalty in sports anymore and took more money to play for the rival Flyers. Talbot received more ice time and had a career year scoring 19 goals and looks to be carrying that into the postseason. Becuase almost all of the Flyers forwards scored goals on Marc-Andre Fleury, Talbot's true John Druce-ness will be tested his Round 2. Schenn really showed off his physical game in the Pens/Flyers series, but he also managed to net 2 goals and 6 points. If the Flyers offence keeps going and Schenn is in on it, he'll be looking to pass his season total of 12 goals and 18 points, which would be true John Druce numbers. Boyle had 3 goals in 5 games, including 2 game winners, and was showing some of that scoring touch he had back in 2010-11 until he got concussed by Chris Neil. He's skating again and if he returns to his scoring form, he could very well top the 11 goals he had in the regular season this year and be a strong candidate for the John Druce Award. Zajac leads the Devils in goals and points despite missing a majority of the season with injuries. While he has already matched his regular season total of 2 goals, 4 assists in 15 games, Zajac will be looking to put up even more offence against the Flyers to help the Devils move on. Phoenix is getting a lot of help from unexpected players, but nobody as helped as much as Vermette with a team leading 4 goals and 6 points. With 11 goals and 37 points in the regular season, if Vermette keeps filling the net like he is and helps the 'Yotes move past the Nashville Predators, he could be a shoe-in candidate for the award. The Coyotes/Hawks series had 5 of 6 games go to overtime, and this Danish forward's 2 goals both came in the OT period to help the Coyotes move into the Conference Semi's. With 4 points in the series, Boedker is not only surprising everyone with his clutchness, but his offence after a 11 goal-24 point regular season. He seems to be off to a great start against Nashville potting a goal in the first game for 3 in the playoffs and 5 total points. After putting up 19 goals and 38 points in the regular season, Berglund is greatly upping his game with 3 goals and 4 assists in the first round. Benefiting from a healthy Andy McDonald and Alex Steen, the Swedish centre could be counted on to put some big goals in on Jonathan Quick in round two. While Nashville's offence in the Detroit series was fairly spread out, Gabriel Bourque leads the Preds in goal scoring with 3 goals despite averaging 11 minutes of ice time per game. During the regular season, Bourque put up 7 goals and 19 points so while he isn't putting up John Druce-like numbers just yet, the potential is definitely there with Bourque earning a lot more ice time in the Preds opening game against Phoenix. Yes, we realize he is a goalie, but he wasn't given much of a chance against the defending Stanley Cup champions Boston Bruins. To that, he responded with a 2.00 GAA and a very impressive .940 SV% to help the Washington Capitals move on following a Game Seven overtime victory. Travis Zajac has scored 25 goals before and over 60 points in a season. He is disqualified from this list. How about Chris Kreider? Kid's a stud. Antoine Vermette has my vote right now.